We had plans for a quiet day and afternoon at the beach . . . but that quickly changed when we got a call from Mardia saying that Samuel was seriously ill. He had been crying all morning, holding his stomach and hadn’t had a bowel movement in over a week. His abdomen was distended and firm – I called Dr. Coleman (a great surgeon) and he was concerned that possibly he had a bowel obstruction and asked how quickly we could get Samuel to JFK for an abdominal X-ray. 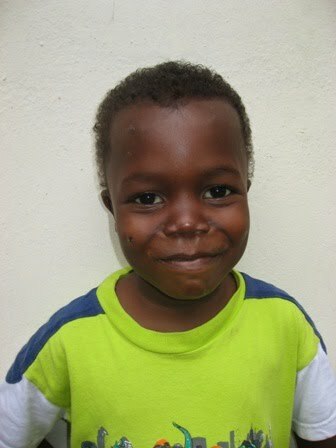 Once we had the results he wanted us to meet him at his private clinic where he would assess Samuel. We left immediately and picked up Samuel and Mardia. Upon arriving at the hospital we met Dr. George who was ordering the X-ray for Dr. Coleman. After the x-ray we realized that Samuel` needed something to lower his fever so we took him to the ER where they gave him a shot. As we waited for the results of the X-ray we met several nice Liberian nurses and a visiting ER Physician from Mt. Sinai Hospital in New York. He started asking questions about Samuel and decided to evaluate him. He ordered several blood tests and then started him on IV Fluids and antibiotics. The x-ray showed that his abdomen was full of stool . . . but there didn’t appear to be an obstruction. His blood results showed that he didn’t have malaria, typhoid or hepatitis but that he was anemic with a hgb of 6.0. A blood transfusion was ordered and we started to wonder if he may have Sickle Cell Anemia. As we reflected on his history it seemed that his signs and symptoms would support this diagnosis. He has been sick most of his life. When he gets a virus or infection he gets yellow eyes and complains of pain in his joints. He has been sick off and on for the last several months that I have known him and we are anxious to have a definitive diagnosis. Hopefully on Monday the lab will be able to test him for this – but for now he is admitted to the hospital with IV antibiotics and fluids.